There have been many great players over the years for the Arsenal FC. Dennis Bergkamp is one of those who has secured a top spot in the club's pantheon. The man was an artist with the football and among his goals were there many masterpieces. Dennis Bergkamp, who was born in Amsterdam, Netherlands on May 10, 1969, was first discovered by Ajax when he was 11. He wound up playing for their youth team – where he learned versatility on the field since they had to learn to play every position. His having to play defense helped him later when he intuitively knew how an opposing defender would try to stop him. That knowledge would help him counteract whatever move his defender might make. That, coupled with his near-infinite creativity, made him a very difficult person to guard. 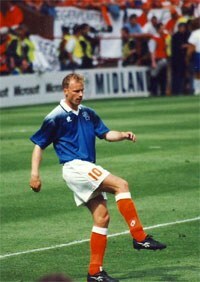 He stayed with Ajax until '93, when he decided he wanted to up the caliber of the teams he played with and against. Italy and Serie A were a strong lure and after a bit of back-and-forth, he chose Internazionale Milano over Juventus. It was not a good fit because the Italian press did not know what to make of his introverted behavior off the field and even labeled him "indifferent." They were merciless at times in deriding him. Two years of playing ball in Italy proved to be enough for Bergkamp and he went to Arsenal in 1995, the club where he would play the remainder of his career. His arrival also heralded a return to glory for Arsenal, which had been experiencing a slide down the standings over the past several years. The club made a big move that really aided Bergkamp's ascent: It hired Arsène Wenger as coach. His aggressive tactics, as well as his installation of a fitness regimen for all players, made his star forward very happy. During his stint, Arsenal won the Premier League three times, the FA Cup four times, and the FA Community Shield three times. He retired in 2006 and was inducted into the English Football Hall of Fame the next year. It was a very high honor since he was the first Dutch player to be voted in. FIFA has ranked him among the Top 100 players of all time and Arsenal ranked him No. 2 among the hundreds of players who have donned their jersey. It often seems like the football field is populated by those who just play the game for money. They may be blessed with incredible athletic talent and can do great things with a ball and their feet, but it's almost like they resent that this is what they do. Not Bergkamp. He played with a childish glee throughout the course of his career. That attitude, along with his willingness to do unconventional things with the football, is what helped him score those incredible goals for all those years, which have been preserved for posterity on YouTube and other video sites. It's why he's ranked among other great Arsenal players like Thierry Henry, Tony Adams, Ian Wright, and Patrick Viera. The stark numbers of his career statistics belie that artistry – 122 goals and 11 assists with Ajax (including Europe and Cup play), 30 goals with Internazionale Milano, and 120 goals and 33 assists with Arsenal (including Europe and Cup play). Those are impressive, indeed, but they don't tell of the masterful control of the ball he had with every bounce, kick, and deflection. Injuries didn't keep Bergkamp off the pitch during his brilliant career. Fear of flying did. This was triggered by a bad flight to the United States for the 1994 World Cup – he was a member of the Dutch National team. After that, he wouldn't take any flights to matches and while he did try to drive or take a train to certain places, the planning of longer trips would have been too much, leaving him open to a bad accident due to exhaustion. He wound up staying home those instances. Like many artists, the 6'0" striker was likely most at ease on the soccer field. His teammates and others may have found him aloof off the field, but he is just a very introverted man. That conceivably caused his fear of flying to gain the control over him that it did. Introverts spend a lot of time in their heads and his dwelling on that 1994 flight may have caused an endless loop of worry. His superstar status probably helped him get away with his accommodations since it's hard to see a club doing this for a lower-caliber player.